Thirty-five Alyawarr and Anmatyerr women from nine communities gathered at Arlparre in Utopia in late May 2017, as part of the Department of Primary Industry and Resources (DPIR)’s “Bushfoods Hub Investigation Project”. The workshop brought harvesters together to share their experiences, strengthen their networks and improve their knowledge. It is only in the last 42 years that seeds have been collected and sold across Australia. Their seeds are sent to cities around Australia to make a range of value-added products. The bush food industry has expanded and grown nationally and internationally with demand for seed increasing. The workshop included senior Alyawarr matriarch Lena Pwerl, and Jenny Hill, Market Development Manager from the DPIR. Industry leaders Rod Horner and Rayleen Brown each contributed their important perspectives to the workshop. Rod has bought and sold seeds and fruits collected by Anmatyerr and Alyawarr women since 1975. 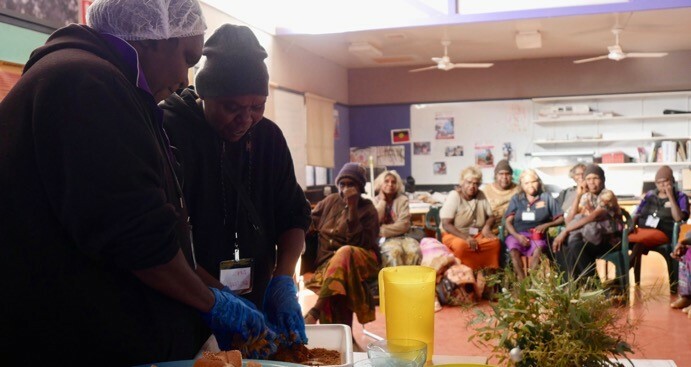 Rayleen is an Arrernte woman, a national leader of the bushfoods industry and co-founder and owner of ‘Kungkas Can Cook’, an Aboriginal owned company specialising in bush foods catering since 1998. Rod and Rayleen are pivotal in linking the women harvesters to down-stream buyers and wider industries. This is the most important meeting. It has needed to happen for a very long time. We need to hear from the women who collect the seeds. We need to hear about how they feel to be part of this growing industry. What do they need? What are their concerns? Do they want help to continue this wonderful work that they are doing? One family at the workshop had three generations of collectors who embody the transfer of a work ethic underpinned by unique practices and knowledge. Rod and Rayleen have each traded with consistent, ethical and practical support to the women for decades. These women are highly skilled and self-motivated. Their knowledge includes the names of specific plants, where they grow and when they produce. Their practices include efficient ways to harvest and clean kilos and kilos of seeds and fruits. Our role was to hear about the passions and the challenges faced by these women and together identify practical ways to support them. We have evidence that wild harvest is a proven production system with quadruple bottom line benefits. Two Anmatyerr women adapt new equipment to demonstrate an ancient method of making of Akatyerr (Desert raisin) balls. Priority issues identified by the participants related to the careful burn regimes needed to maintain seed and fruit production; better understanding of weight and pricing variations; product preparation and cleaning techniques; development of media and resources that support younger people to learn; integration into Community Development Programme and other work programs; improvement of local nutrition through bushfoods in-store policies and sales; and, improved communication back and forth along the economic value chain to improve rights and responsibilities of harvesters and others. The women proposed further events that allow them to meet, share and learn new knowledge and practical skills. This is likely to happen in 2017 in the next hot season when wattle seed crop is ready for harvest. DPIR financed the workshop and Central Land Council Land Management section provided support to harvesters as traditional owners. 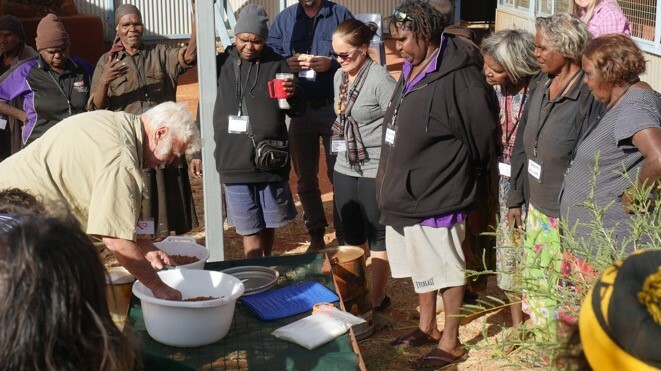 The workshop was also supported by Batchelor Institute of Tertiary Education, the Aboriginal Interpreter Service and Urapuntja Aboriginal Corporation. Rod Horner demonstrates washing and drying methods required to maintain Akatyerr fruit quality and meet industry standards. What is a PIC and do you need one?